Sadly, we never had the chance to meet S.L. Jones prior to his death in 1997. Our friend Maggie Wenstrup always got a twinkle in her eye and an excitement to her voice when speaking of the artist. She was particularly squeaky with delight to show this facet of husband Richard Wenstrup and her vast collection of self taught artists. 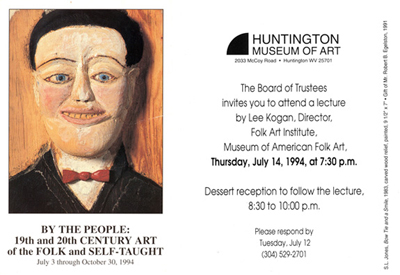 We purchased the drawing of three figures from them in the mid 1980's. Their collection included not only the coveted sculpted heads and tableaus, but also dozens and dozens and dozens of his drawings. One wall located on the second floor of their home, a creative morphing of an old log home and international style architecture, displayed approximately twenty framed S.L. Jones drawings in a grid. I noticed if one squinted, the drawings and colors blurred to create other kaleidoscopic patterns. The drawings were mostly figural, or those which depicted people with horses, said to be among his favorite subjects. Our attempts to win bids at auctions which presented his sculptural work were quickly dashed. We continued to persist in hopes that persistence actually paid. We finally succumbed to the obvious- shallow pockets! We did purchase one of S.L. 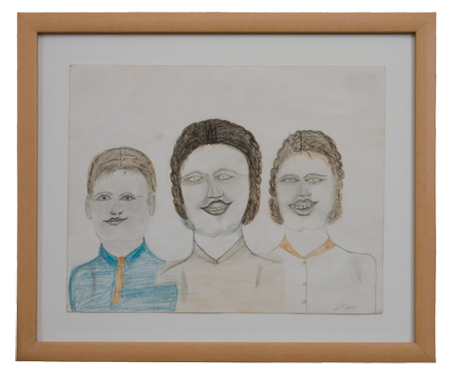 Jones' drawings at an auction of two private collectors held at Kimball Sterling, Johnson City, Tennessee in 1997. 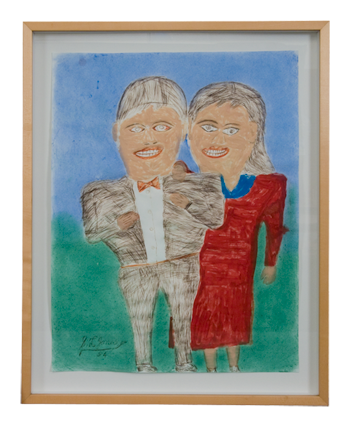 Again, we were drawn to a drawing made in 1994 titled "Man and Woman" with pen and markers of a beaming couple. By the time we purchased this piece the price had been bid up by other interested parties. Although we are content in having two fine example of his drawings, we regret having not met the artist himself while he was living and purchased more of his inimitable work.